I feel like a reporter debugging a misunderstood fact. In this case, it’s a claim to fame and tourism. 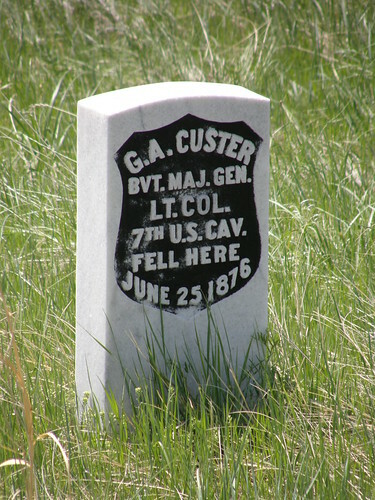 I’ve been to the famous George Armstrong Custer’s grave-site. Now that might not seem odd but if I told you that 3 different states claim his body is buried within those plots, well…then the plot thickens. Imagine my surprise when on a trip to the Little Big Horn battle field in Montana a tour guide told me–here lies George Armstrong Custer. I said the same George who graduated from West Point in 1859? She said yes. I said well he is buried at West Point, NY too. She ask how I knew….I said cause I was just there a few days ago and I saw it for myself. She didn’t believe me at first. In 1991-1993, Mr. Delicious was stationed at West Point, NY which is the Army’s military academy. It’s the United States Military Academy at West Point, NY. It was established during the presidency of Thomas Jefferson in 1802. It was first called Fort Arnold after Benedict Arnold. When he became a traitor–the name was changed. Mr. Delicious was an Air Force officer stationed at a Army base. Previously, we had been stationed at the United States Air Force Academy in Colorado Springs, Colorado. I told you he was a braniac. He was an AOC at USAFA and a TAC at USMA. AOC and TAC are the same job. AOC, is Air Officer Commanding and TAC is Tactical Officer. Most academies have approximately 4,000 cadets at any given time. Both academies are the military’s 4 year college with officer training included. The AOC/TAC is the officer in command of the squadron/company of cadets. Wiki photo of the USAFA chapel in Colorado Springs, Colorado. This is the prettiest place I’ve ever lived. We almost retired to this area but came home to NC instead. The TAC’s and AOC’s are the commanders for the cadet squadrons for AF and a cadet company for the Army. Each squadron or company has approximately 100 cadets. So that makes 25 per class for each squadron/company. The first class cadets at the USAFA are called Firsties, sophomore’s are 3rd class and so on. There are other nicknames but I want to tell you how we ended up at the Battle of the Little Big Horn in Montana. Our tours at the academies were fun but they were not my husband’s primary career field. He would re-enter his career field at the end of his AF time. I will also talk about that at a later date. I have to keep you coming back to hear more of the story. Without bragging on Mr. Delicious too much—he was such a good AOC at USAFA that he was chosen by the AF to represent them at the Army’s West Point. It was a program where an officer from each academy was exchanged to show cadets on both sides that all officers from all branches are to be respected. In theory this worked—but let me tell you that there is a real rival between the two branches and we got hazed constantly. Our family has a whole new appreciation for the Army. I like to say that the AF does things with the least amount of effort and the Army does things the most manly way possible but both arrive at the same conclusion. The Army would march to destination A with a backpack full of heavy artillery and a month’s worth of rations and the AF would fly in ahead supporting a ground invasion. With the utmost respect, both are intelligent branches of the service and support each other on every front. See West Point and photo credit:Here My husband’s office looked out on to this area. His office was in the building behind the cadets. So here we were in the Army’s world located at the most historical place in the United States. I was over the top interested in every square inch in of this place. I challenged myself to become a tour guide for the academy and learned a great deal of history to do so. Most of the employees of the West Point Tour company are military wives who work there until their husbands are transferred. This was my case. The tour included the graveyard where so many heroes and soldiers are buried. I have enough wonderful stories from that duty assignment to fill another book. George Armstrong Custer died fighting against the Indians. According to the Indian Holy Man, Sitting Bull…the Army was not going to win that day. Sitting Bull had a vision that the Indians would be victorious. They were and thus ended the career of Custer. Several times a day, I led a tour group of about 50 people past the grave-site of George Armstrong Custer and Elizabeth Clift Bacon who were buried side by side at West Point. But on this day, we stood at another grave of the same Custer but there was no Libby. I was almost offended for her. Custer might still be in Montana–which in my opinion is where he should be. I think he left his heavy heart there. He loved the Indians. Mr. Delicious and his family had finished our tour at West Point and it was time for him to go back to his primary career field. This would take us from New York to Montana. We were on our way to Malmstrom AFB in Great Falls, Montana. On our way we took many side trips. As you guessed, one of them was this battle sight of the Little Big Horn. Custer’s Last Stand! www.annebelle.com is a wonderful site chock full of the history here. Photo above came from that site. There is no doubt that he died while leading a raid at the Battle of the Little Big Horn in Montana. If you take a tour of that battlefield out in the middle of nowhere, you’ll see how remote it is. They will tell you Custer and his brothers along with a few other family members–are buried on that hill. There are no cities close by to take in the wounded. The men who lived through the battle but were wounded, died in great numbers also. There is also a burial sight for the horses. The tour guides at The Little Big Horn battle field explain that it was a mass slaughter of Custer’s band of men. 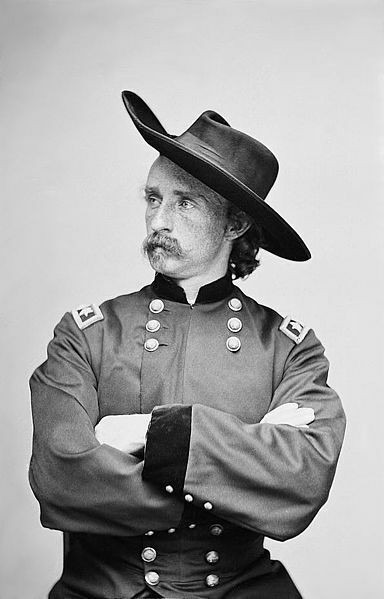 Custer had not been properly backed and went in poorly manned. The bodies were buried where they lie and it is unlikely his body was moved a year later. The army argues that officers were buried differently than a common soldier. They assume that these differences would help identify where the officer graves were located. There were several steps to follow when burying men of rank. And true, the officers may have been properly buried at first but then those graves were raided and the bodies and belongings were strewn about the countryside. 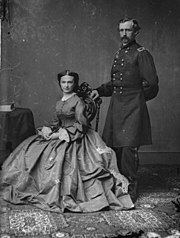 Libby, Custer’s wife, petitioned the government to go get Custer and bring him back to West Point, NY where he deserved to be buried. Libby was a persistent person and the government sent a few men out to the battle field a year later and brought back the remains of a body. There is no clear evidence that Custer’s body is the one laying in the elaborate grave Libby had prepared for him at West Point. But none the less, West Point or The United States Military Academy proclaims that they have Custer buried in their cemetery. 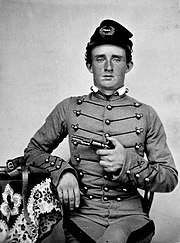 Below is Custer when he graduated from West Point in 1859. Many of the men who fell with Custer on that day in June of 1876— including his brother who is also a famous Custer—are buried at Arlington National Cemetery and Leavenworth which is the 3rd place that people think George Armstrong is buried. It isn’t unfeasible to think that a part of him could be at all four. The original burial ground in Montana reports that the soldiers were badly mutilated and scalped. Bits and pieces of the bodies were intermingled. The burial sight at the Little Big Horn is called Custer’s National Cemetery. There are several little grave markers there with a few bones inside. What do you think? Do you think Custer is laying beside Libby at West Point? Now the story above is more my account of the adventures in our life. If I have wrongfully stated a fact or name it was unintentional. This is my opinion about the facts and should not be taken as historically correct. And…this is not chapter two of Mr. Delicious–but it was part of my research for the next chapter. Your blog is like a wonderful library or bookstore…totally “soup to nuts”! I just posted my book tag and so on. Thanks for invitiing me to play! Oh Goodie—I can’t wait to see what you have done! Yes, true, I don’t stay on topic. Whatever I’m thinking at the moment goes on record here–good or bad. Thank you. What an interesting site you have. Looking back I find everything from dinner plates to 60’s culture, George Custer to roses. I love the variety! I’m glad I found you. Your blog and pictures are stunning. The Autumn photos as you described–do bring back memories of all the Autumn past where our memories are so comforted. I enjoyed exploring your blog and getting to know you. I hope you’ll be back often and thanks for stopping by. A very interesting and informative post. I’m betting Custer lies in West Point. I’m hoping for Libby that he is at West Point also. There were measures in place to bury an officer properly but we just don’t know if the time was taken to do that. Some say he was recognized by his long curly golden locks and others say his body has certain characteristics that would be obvious, and then there was that famous coat he wore. But as I read on and my interest drove me to answer those questions that become obvious during research—I just wasn’t convinced that dear Custer was anywhere except a part of the rich soil of Montana. Very interesting! I didn’t know any of that. And I agree with Cindy–you are a natural storyteller! Susan, I need to hear that because I first considered myself a writer and was frustrated that the story came to me but not the best describing words. I read a great deal and you would think my vocab would be much better. Instead, my language reverts back to the simple times of my childhood. I use the words very and so quite a bit. But it is a comfortable style for me and so..off I go. When someone as successful as yourself comes along and enjoys my story–well that just makes my heart sing. My husband was reading my blog last night and I shared with him my frustration of not being able to write better and he was sweet and encouraging. He agreed that my vocab is not there but that doesn’t matter–he went on to say that my writing style best describes who I am. He has always loved that I’m thrilled with every little thing in life. He says I can make a story out of anything. Anna – I bet you were a great tour guide. You are a natural story teller. This is very interesting about Custer. I guess it shows something about his character that 4 places wish to claim they are his final resting place. That is a great compliment or is it complement–I can never remember the difference between those two words. I would like to think that I can tell a story. I don’t have a vast vocabulary even though I read a great deal. I think it’s habit. My grandmother and great aunt were the very best story tellers. My aunt could spin the best tale ever and NC provides so many rich and interesting tid bits. Well Tyra, they say you shouldn’t mix different topics on your blog but I threw that out the window years ago. I blog about what interest me that day. Now granted, I’m mostly interested in Gardening. I love NC history too. It’s just fun to talk and talk then see what people think. Thank you for being a part of that. I don’t where he is buried Anna but such as fascinating story – learnt a lot. I think you are probably like me in that….this story came from some research I was doing on the chapter 2 of my book about Mr. Delicious. I start remembering things and distracted by another 100 rabbit trails. Then I’m at the computer for hours. I love the research perhaps more than the story.